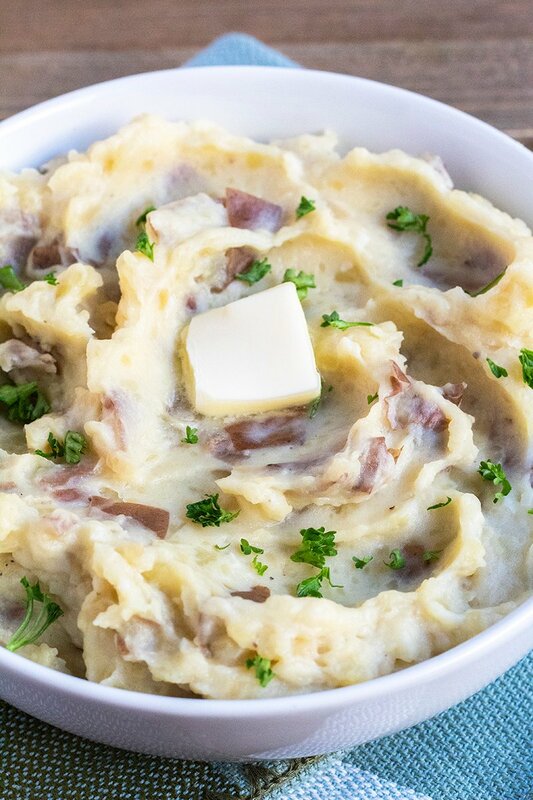 These Garlic Mashed Potatoes are creamy and delicious. Made with minced garlic and cream cheese, it’s the best side dish and one that everyone will love! 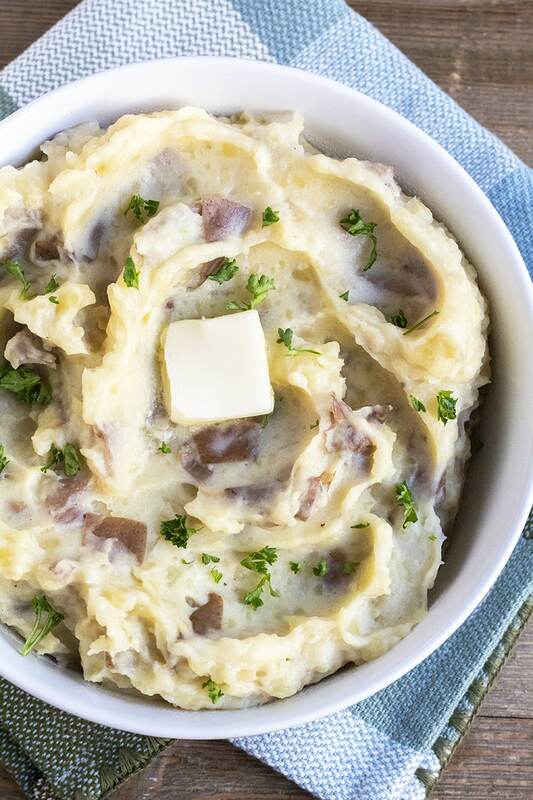 Mashed potatoes are a classic side dish that goes with any meal. They are easily one of my favorite food, and making them homemade is really simple. This recipe is creamy and seasoned with garlic. Start by prepping your potatoes. I used red potatoes, but this recipe would work with any potato you prefer. Some days I leave the skin on and other days I peel the potatoes before dicing them. Either way is fine. Bring the potatoes to a boil in a large pot of water, cook until tender, and drain. In that same pot, saute the garlic in butter for a couple minutes. Add the potatoes back to the pot. Remove from heat, add in cream cheese & seasoning, and mash together. Add your milk and mix until smooth. Adjust the amount of milk to your preferred texture, and season to taste as needed. For this recipe, I used jarred minced garlic, but you can also use garlic cloves or even garlic powder. If you want to use garlic powder instead use 1 teaspoon garlic powder. 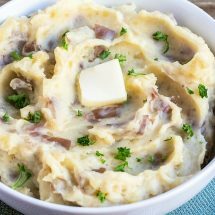 You could skip the melting butter step and just add your butter to your drained and tender potatoes along with the cream cheese. If you are using fresh garlic then you could use 6 cloves that are pealed. Cook and mash them with your potatoes then add the cream cheese, seasoning, and milk. If you love potatoes as much as I do then make sure to check out these other potato side dish recipe. 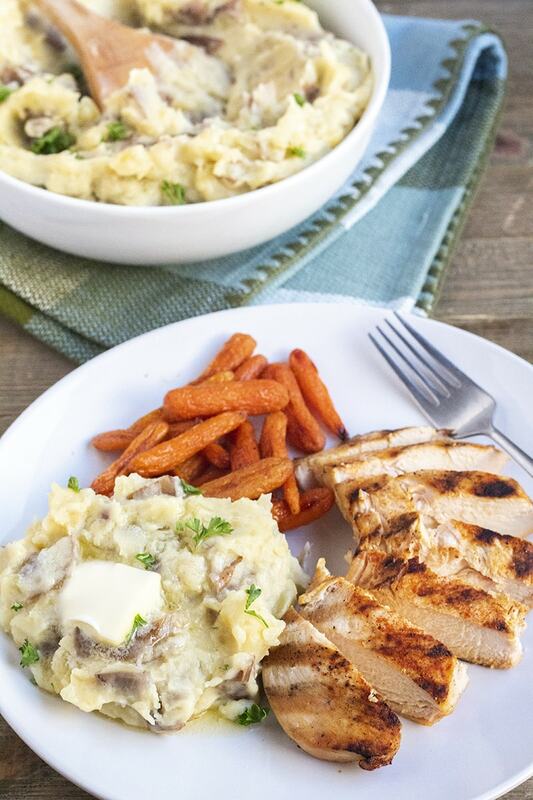 These Garlic Mashed Potatoes are creamy and delicious. Made with minced garlic and cream cheese, it's the best side dish and one that everyone will love! If desired, peel potatoes, or leave the skin on and dice potatoes. Place in a large pot and add water to cover potatoes. Bring to a boil and cook until tender, about 20 minutes. Drain potatoes using a strainer and set them aside. In the same pot on medium heat, add butter and minced garlic. Allow butter to melt and cook garlic for 1 to 2 minutes until aromatic. Add potatoes back into the pot and mash. Remove from heat and add in cream cheese and mash until cream cheese is melted. Add in salt and pepper and continue to mash. Adjust seasoning to taste. Finally, add in the milk and stir until smooth. Add more milk as needed to get the desired texture. Transfer to a serving bowl and garnish with parsley if desired.